The F6F‑3/5 Hellcat is the most successful naval fighter series ever built. With pilots of moderate training levels, the airplane could more than hold its own against its opponents, while it was tractable enough that the same moderately‑trained pilot could bring a damaged Hellcat back and get aboard his carrier, a point of no small importance in naval warfare. It is the only fighter of the Second World War to remain essentially unchanged in basic design from its introduction to service to its post‑war withdrawal, with the main difference between the two production variants being engine power. To straighten out the myth of the airplane, the Hellcat was not produced "in answer" to the Japanese Zero, which would be its major wartime opponent; it would have been impossible to design an airplane starting in 1942 (following the discovery of the Zero in the Aleutians that August) that would have had any hope of getting into production in the required timescale. The Hellcat was already in preliminary design stages well before the outbreak of the Pacific War, and first flew about the time of the Battle of Midway. What was indeed fortunate was that both Grumman and the "Fighter Desk" of the U.S. Navy's Bureau of Aeronautics had paid attention to what was going on in Europe with regards to air combat. They guessed right in giving the Hellcat the biggest wing of any Second World War fighter for maneuverability, and the largest ammunition capacity, to improve its ability as a fleet defense fighter. They were fortunate that the airframe was amenable to initial change from the underpowered R‑2600 to the far‑superior R‑2800, the finest radial piston engine ever built. With this engine, the airplane had sufficient power to outfly its opposition. do both with their airplanes and their weapons. With this superior gunnery training, many Hellcat pilots became an “ace in a day" in the swirling air battles that began over Truk in early 1944, and then moved on across the Central Pacific with the invasions of the Marshalls and Marianas later that year. Striking across the breadth of the Pacific against Okinawa, Formosa, Indochina and the Philippines during the summer and fall of 1944, Hellcats shot down everything they ran across. From their first introduction into combat in the summer of 1943 through August 15, 1945, U.S. Navy Hellcats shot down over 5,000 enemy aircraft, and over 300 Hellcat pilots achieved ace status while flying the airplane. Truly, it was an "ace maker." Many modelers wondered why Eduard would do a Hellcat when two different good models were already available. After studying this kit, I can say that they did it for the same reason they released a series of Fw-190s in 1/48: their product is superior. The kit has surface detail that is superior to either the Otaki or Hasegawa kits, with very petite engraved rivet detail along panel lines, and separate control surfaces that can be posed dynamically. The kit includes a nicely-detailed cockpit in plastic, which is accompanied by very good pre-painted photo-etch detail for the cockpit that is up to Eduard’s usual standards. 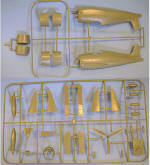 Cowlings for the early-production, mid-production, and late-production F6F-3 are provided. 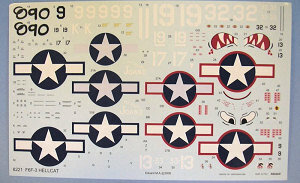 Decals are provided for no less than five F6F-3s, including “Gadget,” flown by aces Alex Vraciu of VF-6, and the “Hell Cat” of LT Richard Stambook of VF-27. There has been the usual brew-ha-ha regarding the release of this kit among those with too much time on their hands over at The Other Place, regarding the accuracy of the kit in general and the “grin” in particular. In his comprehensive review of the kit, Brett Green points out that of the available Hellcat cowlings - both those from kits and those from aftermarket producers - none is entirely accurate, though some are moreso than others, concluding that the Eduard cowling is overall the most accurate. This is also the conclusion that has been drawn after copious study of photo comparisons between actual Hellcats and the kit, from those participating in the commentary Over There. There has also been comment about the rivet detail on the kit. While I generally side with those who believe rivet detail in 1/48 is likely to be overdone and therefore best not done, the rivet detail here is as petite as that which appears on the Eduard Fw-190s. It is also a nice representation of the rivet detail I have seen on the 1:1 Hellcats that live out at Planes of Fame. I particularly like that the canopies are thin enough that they can be posed in the open position, since this is likely the best-detailed cockpit of any Hellcat kit, including the aftermarket resin cockpits that have been released over the years. The decals are very nice, with the insignias the proper size and dimensions and color. The white numbers appear to be sufficiently opaque that they will go over the blue colors without problem. 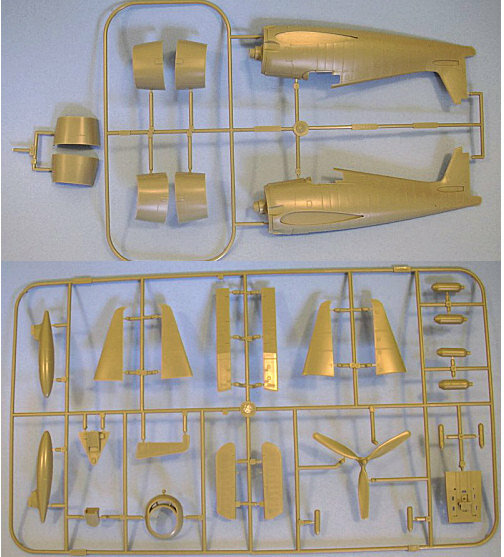 While the Otaki and Hasegawa Hellcats are good kits that can form the basis of nice models, any modeler who really wants to “get it right” will have to purchase aftermarket decals and various resin bits, be it a cockpit for the Otaki kit or a new cowling for the Hasegawa kit. 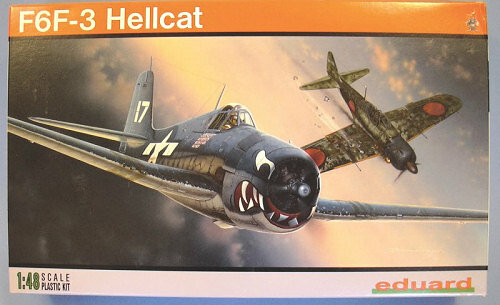 The Eduard Hellcat gives a modeler everything they need: the different cowlings for the different production versions, a highly-detailed cockpit, and interesting, well-produced decals. Getting all the extras for the other kits will result in the overall cost being closely competitive to the price of this new kit by Eduard. The Hellcat is one of my favorite Navy fighters, and this kit provides a very good basis for the creation of an excellent model. Highly recommended. Thanks for Eduard for the review kit.